Remember when Overkill’s The Walking Dead was supposed to come out on Playstation 4 and Xbox One? It’s been a while since Overkill last discussed the fate of those ports. Was there a reason? If Overkill and its parent company Starbreeze Studios had stuck to their current release plans (February 2019), we would be getting trailers and screenshots for the console versions of OTWD right about now. Instead there has been no promotion whatsoever, and a brief statement from Starbreeze suggests it’s because the console ports have been pulled from release, to be held in limbo indefinitely. Starbreeze AB is currently evaluating and reviewing the performance of the game OVERKILL’s The Walking Dead on consoles. Overkill’s The Walking Dead has been a long-delayed project. Part of this was just due to its ambition, promising to be the loudest, noisiest, most expensive game to bear the Walking Dead brand. It was to come out for everything, including VR. It was first announced back in 2014 and has been given multiple release date adjustments since then, as well as down-scaled release plans. 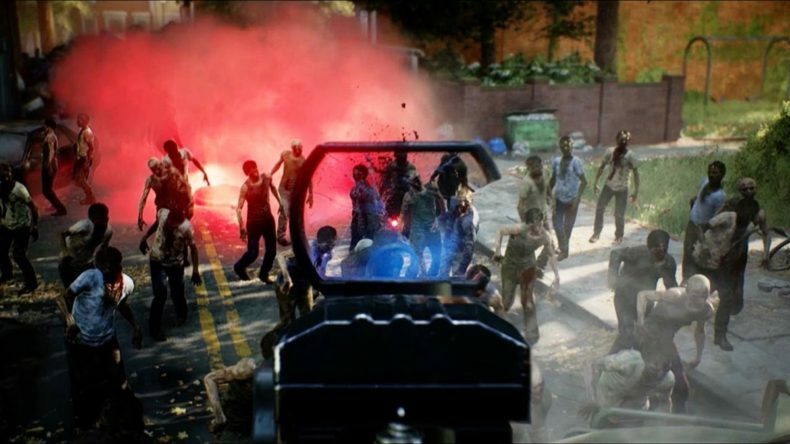 Part of the hesitance from Starbreeze may have to do with the fact that Overkill’s The Walking Dead hasn’t been the surefire success they were certain it would be. The game actually did come out for PC via Steam last November, and it did not receive high marks from critics, nor did it attract a large gamer userbase — critical for a title with heavy emphasis on multiplayer and team battles. In short, this may be the last we hear from Overkill’s The Walking Dead, overkilled by its own ambition and lack of talent to follow through with its plans. Such is business, such is life.